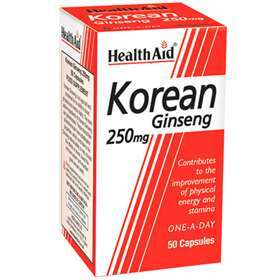 HealthAid Korean Ginseng provides 250mg of the age-old herb, Korean Ginseng in each capsule. Renowned for its benefits to physical and mental vitality. Ginsenosides is the main ingredient in Korean Ginseng, these steroid-like phytochemicals have adaptogenic properties which contribute to the natural reduction of the effects of stress, boost the immune system and maintain healthy sexual health. Contains 250mg of Korean Ginseng Extract. Naturally contributes to the lessening of stress, boost to the immune system and support of sexual health. Free From Yeast, Gluten, Wheat, Lactose, Dairy, Sugar, Salt, Artificial Colours, Preservatives & Flavourings. Suitable for adults and children over the 16 years old. Take one capsule daily on an empty stomach. Bulking Agent (Soybean Oil, Vegetable Shortening, Yellow Beeswax), Korean Ginseng Powder, Hydrogenated Soybean Oil, Capsule Shell: Gelatin, Glycerol, Purified Water, Black Iron Oxide, Red Iron Oxide, Yellow Iron Oxide.